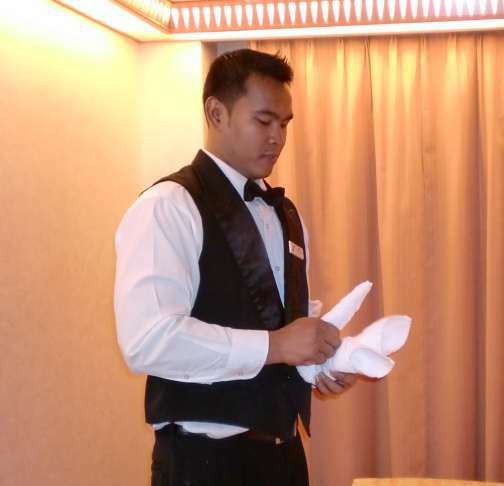 Every night cruise ship passengers around the world return to their cabins to find a towel animal sitting on their bed. 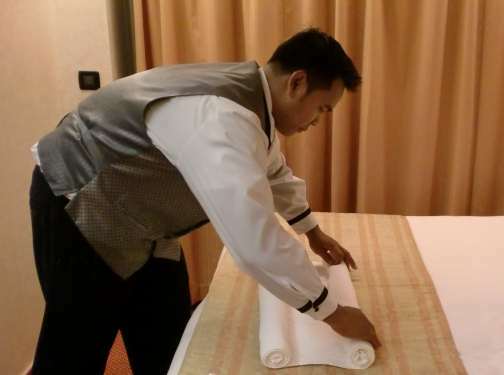 Stateroom Stewards fold these animals with ease, while passengers puzzle over how it’s done. 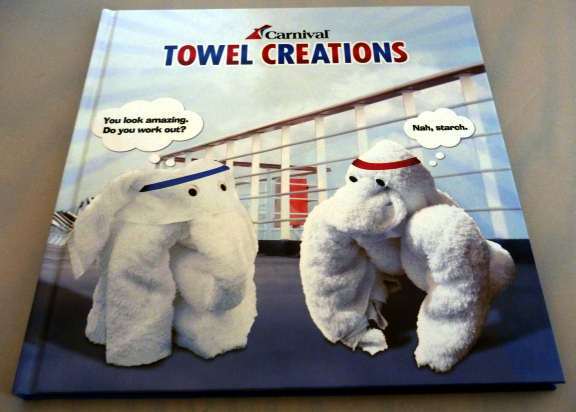 Carnival has a new edition of their towel animal folding book, available for sale to passengers on their ships. 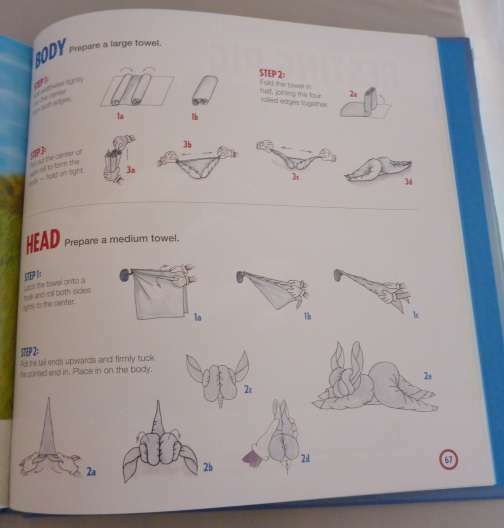 The book includes photos of numerous animals with line drawing pictures of the how to steps of folding each one. Many animals, including my own invention – the crab, use the same basic body, placed in ever changing positions for different animals or even variations of the same animal. Our rabbit for instance started out lying down, but on the second folding for the video became a sitting rabbit instead. For the main body this rabbit and many other animals use, start with a bath towel. Roll each end into the center. Astika said the secret is to start the roll with just a very small bit folded over. Fold the rolled towel in half crosswise with the rolls to the outside of the fold. Pull the corners of the towel out of the center of each roll. Grab the pulled corners of both ends of one roll in one hand, and the pulled corners of both ends of the other roll in the other hand. Pull them tight and stretch into animal body with four legs. Position the body the way you want it for the animal, whether sitting or lying down. Make the head. For the rabbit head, use a hand towel. Either hook the center of one long edge over a wall hook, or hold it to your chest with your chin, leaving both hands free. Roll both sides from edge to center at the same time until they touch in the center and it resembles a long triangle. With the rolled part to the outside, fold in half and push the tip end between the two rolled sides. While holding tightly to the two rolled ends with one hand, curl the tip end around itself and tuck it in between the rolls. Pull head tight, position on body and decorate as desired using colored paper to make eyes and nose. This is the second in a series of individual towel animal folding blogs, which started with the easy towel seal. Other easy animals include the penguin and the crocodile. 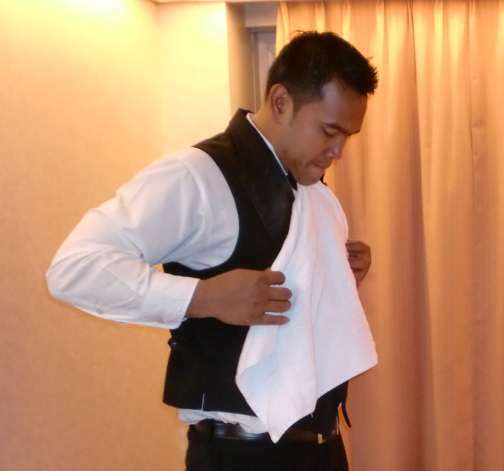 You can also check How to Fold Cruise Ship Towel Animals for more towel animal folding instructions. Up now: Towel Frog, towel gorilla, hanging towel monkey, pig, snakes, elephant, my very own towel crab, the really easy to make towel cake and many more including my favorite, the fire-breathing dragon. The easiest way to find other towel animal folding instructions is go to the towel animal page and click the picture of the animal you want to make. If you want to make sure you don’t miss any future animals you can easily find this blog again by liking My Cruise Stories facebook page or following this blog. 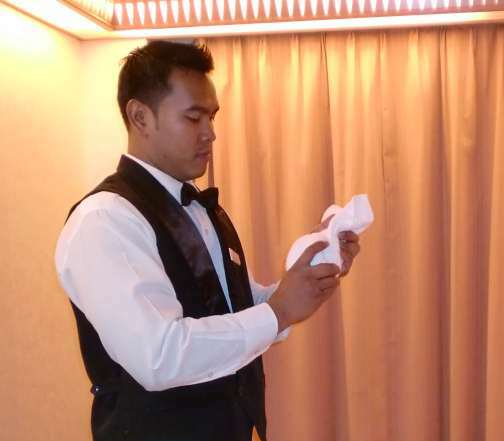 This entry was posted in Carnival, Liberty, Towel Animals and tagged cruise, cruise ship towel animals, how to fold towel rabbit, photos, towel animal folding, towel origami, towel rabbit, towel rabbit folding instructions, video. Bookmark the permalink. Wow! I have never seen these towel-figures before – they are amazing! Many of the cruise ships have them, that is where I got introduced to them. It is always fun to come back to the cabin each night and find a new towel pet waiting on the bed.